Oh, the wonderful memories that are made when we watch our children as they discover their own unique ways into the world of...finger foods. The total concentration needed for the serious business of mashing a piece of banana between clenched and unclenched fists of the chubby baby variety. The intense hand-flapping and close scrutiny then needed to dislodge said banana;The magical range of completely unselfconscious facial expressions that accompany the feel, sound, smell and taste of new foods;The volume and intensity of the raspberries blown in judgement;The amazing number of original and stylish ways in which toddlers can wear breakfast, elevenses, lunch, tea and supper...need I go on? From the first squidgy experiment onwards, finger foods become an important part of life for our growing children.As the providers of these finger food feasts, it’s up to us to maintain our kids’ interest in them! Wholemeal bread; crusts removed and cut into soldiers. Pitta breads; cut into strips. Bridge rolls, sliced along the length. Serve breads with fresh vegetable purees, sticks of raw carrot, cucumber, celery and cherry tomatoes. Tuna and tomato ketchup, mixed together. Hard-boiled eggs mashed up with cress and yoghurt or salad cream. Cheese spread and tinned mandarin segments. (For older children learning to read, make sandwiches and cut them into interesting shapes; spell out ‘Happy Birthday’ in butties! 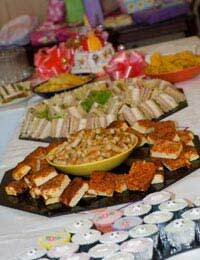 )Further assorted savoury munchies could include: Crispy, crunchy, savoury biscuits, mini vegetable or sausage rolls, cheese sticks, straws, triangles and cubes. Top some of the bread with mashed banana and honey, some with jam.Individual cup cakes-they are easier for little ones to manage than solid lumps of cake.Wash and prepare fresh fruit as and when it is wanted-let other parents know where it is so they can do it themselves! The next stage of finger foods for children must grow up with them.Sandwiches and savoury biscuits are always popular and some of the fillings already suggested for younger children are acceptable, but older kids may also enjoy garlic bread, a little pickle in their cheese sandwiches, tuna and sweetcorn mixed with a blob of salad cream, cold meat and salad, egg mayonnaise, salmon and cucumber. Bowls of washed grapes, apples and other fresh or dried fruit provide healthy palette-clearing nibbles that go amazingly quickly! Cover and decorate your table-to add appeal to the food and help to create a sense of occasion-and also to protect it from the inevitable spills. Colourful straws and plastic cups, bowls and plates will help add to the atmosphere, while party hats, balloons and streamers can provide a little extra noise and excitement; if it’s needed. When the children get older, finger foods still have their place.Picture a roomful of bigger, hungrier, messier kids on a film and food birthday sleepover...tortilla wraps, pitta breads and dips, chicken pieces, cold sausages, spring rolls, pizza slices, samosas and, always, but always, fresh fruit!